QED J2P review | What Hi-Fi? You have to hand it to QED. It's done a fine job of making this 3.5mm-to-RCA phono cable look as glamorous as possible. But a glossy red sheath and chunky sockets aren't much use if sound quality isn't up to scratch. Thankfully, the J2P puts in a great showing. Hooked up to a media player, it promotes a clean sound, packed with detail, and boasting superior dynamics over many rivals. Music flows freely, bass notes stop and start with conviction and there's great expression and emotion in the midrange. 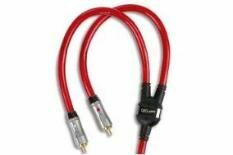 There are iPod-specific cables that bypass the player's analogue circuits for a better sound, but still, this is a great universal cable that works well across a broad spectrum of portables.